Dhaka, Nov 24 (Just News) : Dhaka stocks advanced on Thursday with the key index hitting a fresh all-time high as investors went for fresh investments in most of the scrips including banks ahead of their year-end closure. 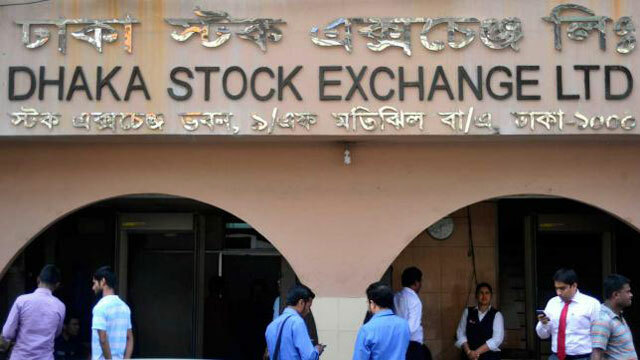 The key index of Dhaka Stock Exchange, DSEX, gained 0.52 per cent, or 33.18 points, to close at 6,322.51 points on Thursday after a marginal gain — 7.45 points — in the previous session. The DSEX’s previous highest was 6,306.95 points reached on Sunday. The equity market opened with a bullish trend in the morning session that remained in the positive trajectory as investors headed for fresh investments after their profit-taking moves in the previous three days, market operators said. Banks got the highest attention of investors, gaining by 1.16 per cent on the day after the sector faced correction in the previous session. Out of the 30 traded banks, 22 advanced, five declined and three remained unchanged on the day. Besides banks, the share prices of cement, non-bank financial institutions and energy gained by 1.1 per cent, 0.7 per cent and 0.6 per cent respectively that also helped the market to end with buoyancy. Social Islami Bank, Pubali Bank and Lafurge Surma were the highest gainers among the large capitalised scrips. Moreover, investors expected that most of the companies would declare better earnings and dividends for the year ending in December. On the other hand, telecommunications, IT and pharmaceuticals declined by 1.00 per cent, 0.4 per cent and 0.1 per cent respectively. The share prices of Grameenphone dropped by 0.83 per cent following a surge in the previous session. Turnover on the bourse, an important indicator of the investors’ participation, declined further to Tk 854.54 crore compared with that of Tk 898 crore in the previous session. Of the 330 companies and mutual funds traded, 185 declined, 96 advanced and 41 remained unchanged. ‘Today [Tuesday] the market started with a positive sentiment and continued till the end of the session,’ said EBL Securities in its daily market commentary. Investors spurred buying pressure on sector specific stocks especially on scrips from bank, fuel and power and financial institution sectors, it said. DS30, the blue-chip index of the DSE, added 0.29 per cent, or 6.69 points, to finish at 2,277.35 points. Shariah index DSES gained 0.29 per cent, or 6.69 points, to close at 1,393.45 points. LankaBangla Finance led the turnover chart on the day with its shares worth Tk 96.74 crore changing hands. AB Bank, BD Thai, Shahjalal Islami Bank, Dhaka Bank, Paramount Textiles, United Power Generation Company, Square Pharmaceuticals, BBS Cables and FAS Finance were the other turnover leaders. Paramount Textiles increased the most with a 9.14-per cent rise in its share prices, while Mithun Knitting and Dyeing was the worst sufferer on the day, shedding 8.06 per cent.